How are greenways designed? What situations lead to their genesis, and what examples best illustrate their potential for enhancing communities and the environment? Designing greenways is a key to protecting landscapes, allowing wildlife to move freely, and finding appropriate ways to bring people into nature. This book brings together examples from ecology, conservation biology, aquatic ecology, and recreation design to illustrate how greenways function and add value to ecosystems and human communities alike. Encompassing everything from urban trail corridors to river floodplains to wilderness-like linkages, greenways preserve or improve the integrity of the landscape, not only by stemming the loss of natural features, but also by engendering new natural and social functions. From 19th-century parks and parkways to projects still on the drawing boards, Designing Greenways is a fascinating introduction to the possibilities-and pitfalls-involved in these ambitious projects. As towns and cities look to greenways as a new way of reconciling man and nature, designers and planners will look to Designing Greenways as an invaluable compendium of best practices. "the reader will appreciate the need for well-designed green corridors that improve the quality of life." 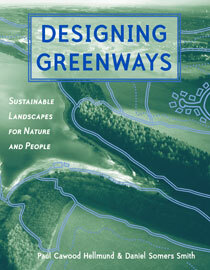 "Designing Greenways presents a practical, applied approach to greenway design within a context of sound science...Greenways are shown to be an excellent vehicle for environmental education and environmental art...Designing Greenways is a well-written scientific and social survey that describes how greenways can be a part of sustainable landscapes." "The ample use of figures and photographs to support the text makes the book eminently readeable. Tables provide fingertip summaries of data. ...the early chapters...provide clear and complete synopses of the history of greenways and the benefits of preserving swaths and stringers of the landscape for ecological and social benefits. This is the sort of book that will become, over the years, a dog-eared favorite in many land use planners' personal or professional libraries." "Designing Greenways remains valid as a great contribution and provides a practical guide for planners, landscape architects, educators, students, citizen groups and conservationists to move from theory to action."